Heeft u een vraag voor Kori Bali Inn I? Met een gunstige locatie in bezichtiging van bezienswaardigheden, spa's, cultuur in Bali, biedt Kori Bali Inn I u een zeer aantrekkelijke plek om even te ontspannen in drukke tijden. Het stadscentrum is slechts 39.2 km verwijderd en het vliegveld kan binnen 62 minuten worden bereikt. Dankzij de praktische ligging, biedt de accommodatie eenvoudig toegang tot alle belangrijke trekpleisters van de stad. Kori Bali Inn I biedt vele voorzieningen om uw verblijf in Bali zo aangenaam mogelijk te maken. Enkele voorbeelden van voorzieningen die de accommodatie biedt, zijn 24-uur roomservice, 24-uur receptie, wi-fi in openbare ruimtes, vervoer van/naar luchthaven, tours. Alle accommodaties zijn zorgvuldig ingericht om het hoogste niveau van comfort te bieden. In enkele gastenkamers zijn rookvrije kamers, bureau, balkon/terras, ventilator, douche aanwezig. De accommodatie biedt vele unieke recreatiemogelijkheden zoals massage, tuin. Kori Bali Inn I is een ideale verblijfsplaats voor reizigers die charme, comfort en gemak in Bali zoeken. The location is very good, walking distance to the main attractions and the center. Room is simple but clean and quiet. The window comes just into a wall so don't expect any view except people passing right next to your room :) Breakfast like usually, just a pancake and tea/coffee. 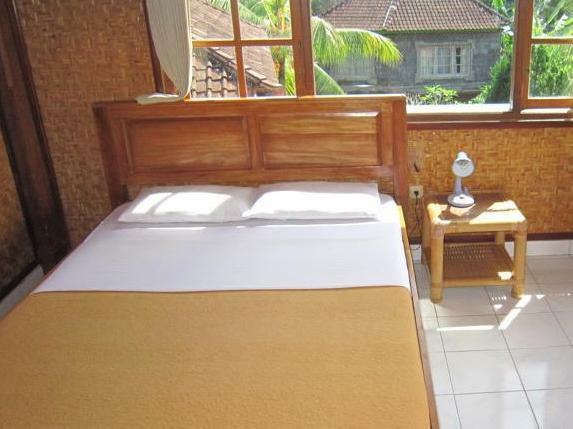 I booked Kori Bali Inn 1 but was moved to Inn 2 due to overbooking. Kori Bali Inn 2 is at the end of a very narrow lane behind CP Lounge. The lane gets flooded when it rains, so you have to walk in dirty water up to your ankles; and you'll have CP Lounge music as background till late at night. The walls of the room are so thin you can hear everything - and I mean EVERYTHING - people are doing in the room next to yours. In addition there was no hot water in the morning, there were several clumps of hair floating around in the bathroom, and the breakfast was terrible. Staff is friendly enough, but so are most people around Ubud. As stated in my previous review (we booked two separate rooms), this stay was exactly what we wanted. It was clean and comfortable; the location was central yet retained its peace and serenity; the views were lovely; the little terraces outside the rooms made it feel like individual little homes; breakfast was beautiful and lovingly cooked; and the owner was just such a joy to have around: ever around to please and serve, with the greatest of smiles and Balinese charm. Would definitely come here again! the owner smiling attitude, the views, the breakfast. We loved staying at Kori Bali Inn I. We first accidentally arrived at "Kori Bali Inn II", but were pleased to see that we were staying here instead. The owner runs a one-man-show, and is the happiest and kindest man there is, with the typical charm and welcoming spirit that is so true of Bali. The views were gorgeous, the location quite central, the rooms basic but comfortable and clean in Balinese style with gorgeous views, breakfast was lovingly and beautifully cooked, the internet a little slow at the top floor, but more than good enough... simply a wonderful stay! And yummy breakfast! Very charming simple room, very happy! The double room has a good size and is clean. The ceiling fan doesn't really cool to room. The bathroom smells bad, but I guess this is kind of the standard in Indonesia. Breakfast is served from 7.30 which is a plus. I chose the banana pancake and got a big fruit salad as a bonus. The only facility missing is a pool. I enjoyed the simplicity of the place. The place was clean, comfortable and homey. Nyoman, the caretaker, was also very friendly and accommodating. The host Nayoman, the tasty free breakfast & breezy spacious rooms. Great, had a relaxing 5 day break, great location, anything I needed was provided by the staff, couldn't ask for more. I only stayed a night but it is central close to resturants, cheap. I couldnt connect to wifi. Staff friendly. Shower is bit difficult but hot water. Good stay. Wir hatten einen sehr angenehmen Aufenthalt. Die Zimmer sind einfach aber sehr sauber. Die Lage ist sehr günstig nahe Palast und Markt, Monkeypark ca. 10 Minuten die Straße runter. Nachts ist esruhig, noch nicht mal die Hähne hört man krähen. Nyoman, der Eigentümer ist sehr hilfsbereit, drängt sich aber gar nicht auf. Sein Frühstück ist großartig. Preiswerte Unterkunft mitten in Ubud und doch ruhig? Hier seid ihr genau richtig! Wir haben den Aufenthalt im Kori Bali Inn sehr genossen. Die Zimmer sind sehr geräumig, hell und in typischer balinesischer Architektur gehalten. Das Frühstück wird vom sehr sympathischen und supernetten Managers Norman direkt auf dem Balkon serviert und ist super lecker. Er hilft auch bei allen anderen Angelegeneheiten, gibt viele Tipps und bucht Touren etc. Insgesamt haben wir den Aufenthalt sehr genossen und bedanken uns sehr bei Norman. Aufgrund Überbuchung im Kori Bali Inn wurden wir in ein benachbartes Hotel verlegt, angeblich zu gleichen Konditionen. Was wir dort vorfanden ist unbeschreiblich und lässt sich nicht in Worte fassen. Die Bettwanzen und Kakerlaken waren noch das geringste Problem. Schlechter habe ich noch nie gewohnt, jedes Dormitory im Hostel ist gold wert dagegen. Fazit: Auf keinen Fall verlegen lassen!!! bien placé mais des cafards dans la chambre. Pas de serviettes pour un hôtel .... Très sale Personnel sympathique mais pas du tout professionnel nous avons fait des hôtels pas cher à Bali avec une qualité de service bien meilleure. La pase increíble me quede un total de 7 noches y fueron de lo mejor... El desayuno es delicioso con 6 opciones para escoger y café y Te siempre en la mesa de el balcon... La limpieza interior de las habitaciones podría mejorar (some spiderwebs on the ceiling OF he room) pero por calidad en comparación con otros sitios en Sur este de Asia esta bien. Toca levantarse bien temprano (6am) para ver la montaña pero vale la pena el amanecer con la montaña es espectacular.